The Himalayas are not merely a geographical feature, a range of mountains. they epitomise people's civilisational identity that goes back to the dawn of history. If these majestic mountains were not there, the rain clouds sweeping up from the Indian Ocean. Our "special" yearly feature drives through most of western Ladakh, monasteries, palaces, villages, hikes and travel to one of the most surreal places on the planet. The trip begins with a flight over the Himalayas into the Trans-Himalayan region of Ladakh in the state of Jammu and Kashmir. We spend a couple of days in Leh town acclimatizing at 11,000 feet above sea level and visiting the ancient monasteries, palaces and villages around Leh. We then drive west of Leh past the town of Kargil and travel south into the valley of Zanskar, one of the coldest inhabited places on earth. Starting the trip on the Stod river, we begin our self contained multi-day river adventure down the spectacular and scenic Zanskar river gorge. The trip takes you down the extremely desolate, remote and sheer Zanskar gorge with walls rising a few thousand feet out of the river bed, culminating on the mighty Indus river, (which incidentally lends India its name). Undoubtedly a classic, this journey to the last truly lost horizon of our shrinking planet - Zanskar, the "land of white copper” is a trip of a lifetime. Fly Delhi – Leh (3466m ; 11,370ft). Transfer to hotel. Rest, hydrate and acclimatise. Overnight Leh hotel. Leh. Acclimatise and sightseeing. For the more energetic a visit to a few monasteries such as Shey, Thikse and Hemis will be arranged. Or choose to realx and walk into Leh town, to its exciting market and outdoor restaurants. Overnight Leh hotel. Drive Leh – Kargil (3201m ; 10500 ft ; 9-10 hrs). We drive from Leh to Mulbek - Kargil, through a spectacular moonscape. We drive over the Fotu La (14,000 ft), a high mountain pass and exit the Indus valley. Enroute, we do a photo stop above the Lamayuru monastery belonging to the 'Red Hat' sect. Overnight Kargil hotel. Drive Kargil - Rangdum (12,000ft). A spectacular drive past Panikar and Parkachik,with magnificent views of the Nun and Kun massifs (7000 metres),hanging glaciers and large meadows.We drive till Rangdum Gompa (12,000 ft).Camp overnight. Drive Rangdum – Remala (3635m ; 11,925ft ; 6 hrs). We drive to Remala, which is the starting point for the rafting trip on the Stod river, a tributary of the Zanskar river. We drive over the Pensi La (14,500 ft), which enables grand views of the Zanskar peaks at the bottom of which is the Drung Durung glacier that feeds the Zanskar river, 40 km below, into which we flow trip the next day. Overnight tented camp. 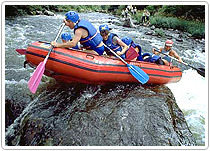 Rafting expedition begins at Remala. Raft till near Karsha Gompa, near Padum. (3496m ; 11,466ft ; 4 hrs) We raft 30 km in 4-5 hrs which includes a break for lunch and hot beverages. We are surrounded by 6000 metre high peaks. River section today includes a Class II section, a good introduction for first timers as well as to the river in general. Settle into camp by afternoon, we can take an optional hike to Karsha Gompa. After a late morning start, we raft from Karsha up to Honyo / Pidmo (3361m ; 11,025 ft ; 3 hrs). This stretch is approximately 25 km with Class II and III rapids. Another easy day to get used to the river, the altitude and hone our paddling skills. After packing camp, we raft 25 km to Nyerak (3286m ; 10,780ft ; 3 hrs) a Class III section. The gorge narrows in on the river - this indeed is a Grand Canyon in its own right. We stop for the day to pitch camp in a gorge below Nyerak village. Rest day at Nyerak. Take a hike to Nyerak village or relax under the cool shade of the willows at our Campsite. Wash up at the campsite stream and enjoy the day off. Todays 35 km rafting section takes us from Nyerak to Lamaguru (3190m ; 10,465ft ; 5-6 hrs including scout and lunch) through the core of the Zanskar A classic white water day with continuous Class III rapids, and a few Class IV rapid where the river squeezes between a gap of about 18ft. We stop for lunch near a huge waterfall and continue to camp at the confluence of Markha river with the Zanskar. Rock formations, spires and an amazing palette of colours add to the trip today. Camp. 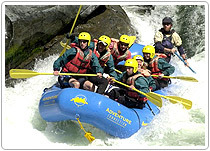 We raft 40 kms of Class III/IV white water from Lamaguru to Nimu (3154m;10,345 ft ; 3-4 hrs) today. We raft past the village of Chilling and exciting rapids as the Zanskar plunges out of the canyon to meet with the Indus at Nimu. We end our trip at the confluence of the Zanskar with the Indus. Drive an hour back to Leh. Last minute retail therapy and a hot shower! Overnight hotel. Transfer to Leh airport. Fly Leh - Delhi. Cricket has been an organized adult game since the seventeenth century when it first took the fancy of English gentlemen lying low in their country estates at the time of the Civil War. Camping is the best way of enjoying the wonders of nature given to Himachal and sharing the warmth of its people. You can carry your own gear along or opt for any one of the several camps that are pitched in various parts of the State.